Geophysicists have discovered a second, even more massive magma reservoir feeding the Yellowstone supervolcano, providing researchers with the most comprehensive picture yet of the volcanic system beneath the park. The Yellowstone volcanic field is the surface manifestation of an upwelling of hot magma from deep within the Earth’s mantle. Geologists call this blazing hot-patch a mantle plume, and the energy released by this particular plume drives the largest continental hydrothermal system in the world. For years, researchers have watched the region closely for signs that could portend a major eruption, but they’ve never known the extent of the magma chambers beneath park—until now. A popular subject among doomsayers, the Yellowstone supervolcano is no closer to erupting today than any other time we’ve talked about it, but geophysicists Thursday reported that our map of the massive system of magma chambers and feeder pipes underlying the infamous hotspot is nearing completion. Their investigation—results of which appear in this week’s issue of Science—used seismic waves from nearly 5,000 earthquakes to image the subsurface at greater depth and resolution than ever before. When mapping seismic wave velocity in depth slices below Yellowstone National park, geophysicists attribute the low-velocity anomalies (red) to magma chambers. Image credit: Huang et al. The newly detected reservoir is massive. Located between 19 and 45 kilometers below the earth’s surface, University of Utah geophysicist Hsin-Hua Huang and his colleagues estimate it accounts for somewhere between 30,000 km 3 and 116,000 km3 of basaltic magma. Compare that to the previously-mapped upper reservoir, which stretches between 4 and 14 kilometers below ground and accounts for just 10,000 km 3 of rhyolitic material. Study co-author Jamie Farrell, also of the University of Utah, puts these volumes in more relatable terms. According to him, the volcanic material in the previously known magma chamber would fill the Grand Canyon 2.5-times. The hot rock in the newly discovered chamber, by comparison, could fill the 1,000-cubic-mile canyon 11-times over. The upper and lower reservoirs are depicted in the video below, in red and yellow, respectively. Huang and his colleagues compiled seismic data from 4,520 local earthquakes and 329 distant earthquakes to map out the volcanic plumbing below the Yellowstone caldera. The seismic waves generated by earthquakes slow down as temperature or composition changes, allowing the team to interpret low-velocity anomalies as magma reservoirs. They detected two such anomalies. The first corresponded to a shallow reservoir that had been mapped by previous studies. The second pointed to an entirely separate reservoir, situated directly below the first, that had previously gone undetected. Contrary to the popular image, these chambers aren’t filled with liquid oceans of molten rock deep underground. The magma they contain is hot, ductile, spongelike rock with only a tiny fraction of melt. Each chamber contains roughly 900 km3 of partially melted magma. Combined, that’s enough to fill the Grand Canyon about halfway—more than enough to engender horrific visions of enormous rivers of lava flooding the land. The newest map of the subsurface below Yellowstone reveals a deep hotspot plume welling up from the mantle, an enormous magma reservoir within the lower crust, and a smaller magma chamber just below the surface. Although the terms are frequently used interchangeably, a magma chamber and a magma reservoir typically differ in the proportions of eruptable magma and liquid mush. Image credit: Huang et al. 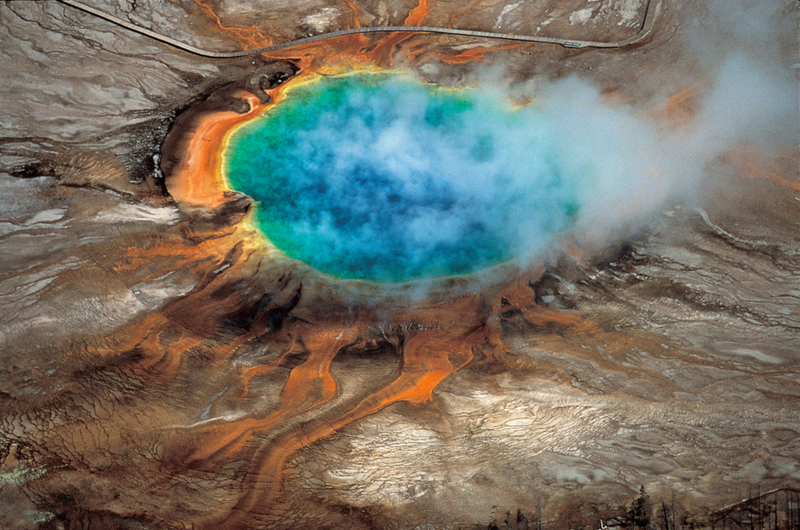 Mapping the magmatic plumbing beneath Yellowstone is important for two reasons. The first is that while geologists have long recognized that the system is powered by a mantle plume, past maps of the magma chambers beneath the park have never fully accounted observations made at the surface. The second is even more relevant: the more researchers know, the more tightly they can constrain hazard assessments of the potentially catastrophic supervolcano. While Yellowstone shows no signs of erupting any time soon, those of us on the surface have a vested interest in learning as much as we can about such a violent behemoth. The study highlights how Yellowstone’s constant earthquakes are actually an opportunity in disguise. As seismic waves travel through different geological materials, they speed up, slow down, refract, and even reflect. As earthquakes in different places send seismic waves propagating through the earth, geophysicists can translate how those waves are altered to create maps of subsurface structures. Yellowstone has a deliciously dense array of seismic sensors that is capable of feeling both local and distant earthquakes, giving researchers plenty data to map out where warm, ductile magma lurks beneath the park. According to Huang and his colleagues, both chambers are fed by and connected to the mantle plume driving the Yellowstone system. This plume produces fractional melting, which leads to compositional difference between the two chambers. The upper chamber houses more silica-rich, explosive rhyolitic magma, while the lower chamber contains more silica-poor, less explosive basaltic magma. The map isn’t yet complete. Although we now know the size and location of these two chambers, we still don’t know the details of how they connect, or how magma moves around the system. The map’s resolution is limited by the density of seismic stations in the area, and the chance distribution of earthquake origins. Field mapping at the surface suggests that most of the dykes, sills, and pipes connecting the upper and lower magma chambers are too small to detect by the methods used in this study, so we don’t yet know if and how the upper and lower chambers are connected. Fortunately, says Farrell, “The magma chamber and reservoir are not getting any bigger than they have been, it’s just that we can see them better now using new techniques.” That means the annual chance of eruption at Yellowstone remains 1 in 700,000, which translates to one or two catastrophic caldera eruptions in a million years. Although we don’t expect to get much warning before disaster strikes, for now all is clear with no signs of impending doom. What the new mapping does do is allow other researchers to have a better handle on the system, constraining their models of the seismic and volcanic hazards in Yellowstone.